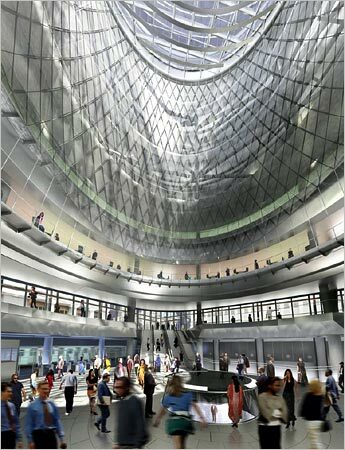 We'll admit: we've never mentioned the Fulton Street transit hub, connecting all of the subway lines that cross Fulton Street in Lower Manhattan because the project has been in MTA cost-cutting limbo ever since the day it was designed. We believed that the interesting building by Grimshaw would get cut and we'd end up with a grand concourse of dark underground tunnels. “We are not building cathedrals here,” said one board member, Nancy Shevell Blakeman. Obviously, MTA isn't building cathedrals. Otherwise, all the transit infrastructure and stations built between 1920 and 1990 would be, you know, gorgeous. And, they wouldn't have let the original Pennsylvania Station be demolished. Shall we go on? Cost overruns are an issue, we agree. But don't sacrifice good public space to save a few bucks. Bonus: the Times also posts the coolest walk-through diagram section we have ever seen. We suggest to the Times to try saving money on the architecture critics and giving David Dunlap and the renderers an expanded beat.